In the Indian Premier League 2019 (IPL 2019) match 17, Royal Challengers Bangalore (RCB) take on Kolkata Knight Riders (KKR) at the M Chinnaswamy Stadium in Bengaluru. Meanwhile, Knight Riders have won the toss and have opted to bowl first. Tim Southee replaces Shimron Hetmyer and Pawan Negi comes in place of Umesh Yadav in RCB's playing XI. Sunil Narine is also back for KKR. Check out the live score updates of RCB vs KKR IPL 2019 match here. With four defeats in a row, RCB are looking for their first win of the season. It has been a disappointing start for the Bengaluru-based franchise. In the opening match, defending champions Chennai Super Kings handed RCB a shambolic defeat and since then they have lost to Mumbai Indians, Sunrisers Hyderabad, and Rajasthan Royals. RCB vs KKR, IPL 2019 Live Cricket Streaming: Watch Free Telecast of Royal Challengers Bangalore vs Kolkata Knight Riders on Star Sports and Hotstar Online. Meanwhile, this will be the 23rd meeting between Royal Challengers and Knight Riders. RCB have managed to win just nine matches, while KKR have won 13. In the last four matches, RCB have failed to defeat KKR. 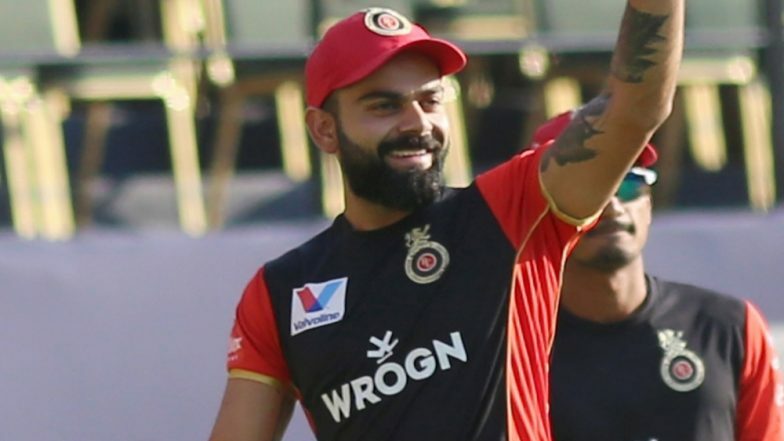 Royal Challengers Bangalore Playing XI: Virat Kohli(c), Parthiv Patel(w), AB de Villiers, Marcus Stoinis, Moeen Ali, Akshdeep Nath, Pawan Negi, Tim Southee, Navdeep Saini, Yuzvendra Chahal, Mohammed Siraj. Royal Challengers Bangalore vs Kolkata Knight Riders Live Cricket Score. Kolkata Knight Riders Playing XI: Chris Lynn, Sunil Narine, Robin Uthappa, Nitish Rana, Dinesh Karthik(w/c), Shubman Gill, Andre Russell, Piyush Chawla, Kuldeep Yadav, Lockie Ferguson, Prasidh Krishna.